My husband's the same way- he says he can just totally be entertained and not have to analyze and worry about holes or writing style or anything like that. In a sense he turns off a certain part of a brain and turns on another than allows him to just totally enjoy the book. Wish I had that skill! Ya it makes reading fun, but it's probably why I didn't do too well in my English classes when it came to analyzing books. THANK YOU. I actually didn't finish the book, but I did Wiki how the series ended. Tris drove me absolutely nuts and Four reminded me of Edward Cullen from Twilight. I HATED Edward's character right from the first Twilight book. So, since I hated the main characters, there wasn't much hope for me. I'd like to see the movie, mostly because Kate Winslet is in it, but I'm hoping that I like it enough to make me want to revisit the book. I didn't like the book either for the reasons you mentioned. However, I did read the second and third just did something to read and she does address some of your complaints (not well by any means...) the nice thing is that the movie is awesome, and it changed parts of the book for the better... Like things that didn't make sense in the book, the movie comes up with reasons for. I would see the movie again in a heartbeat. This makes me excited to see the movie! And I have heard that she kind of tries to resolve questions in the second or third book, but to me you have to cover your holes at least enough to make readers willing to go to a second or third book. For me, at least, I'll never see the explanation because she didn't lead me on enough in the first book. What a breath of fresh air! I'm getting so sick of the new dystopia fad. Publishers are putting trashy novels through just because they fit the trend. Honestly, whatever happened to quality literature? Agreed! I don't think I can do another dystopian novel for at least a year or two. My sister, though, who works a bit with publishers and agents said that they won't even read a dystopian novel now. I guess it is past its prime. On to something new. It definitely goes in fads- vampires, dystopias, what's next? She leads up as to why being divergent is so taboo and uncommon in the 3rd book, because everyone is an experiment and all the faction people are genetically unpure and damaged, so tris being divergent she has pure genes, stupid. I know. Also with not being able to love her brother anymore is because "fraction before blood" is a common practice because you should devote your life to your faction, the 2nd book gets more into detail with that when Tris's brother helps with her death because he is Erudite and is loyal to Jeanine. The 3 book is not worth reading I can't even tell you what has happened and I am still reading it. Roth decided to switch from Tris's point of view to Tobias's point of view FROM CHAPTER TO CHAPTER. So not consistent with the 1st 2 books. Just another corrupt government to fight against and try to be free but they never are because their genes are "damaged". She kills everyone in the books and it pisses me off. I just don't like the 3rd book yet I am still reading it because I just need something to occupy me during work & I just need to see how she wraps up this poorly done book. Ps the movie is pretty good, I enjoyed it. Better ending than the book, I think. My comment is poorly written, I didn't proof read. Oops... But you get my point, didn't enjoy the books. I would hope the ending in the movie is better because the ending in the book was so bad, no one would want to watch that! Interesting what you say about genetically damaged and how they would be naturally inclined to choose one faction over another. See, that's all I needed right there. A little explanation in the first book so that I understood WHY Tris was special. But then it also kind of books me because now they're basically saying Tris is special because of her genes, not because she is actually an awesome person who works hard and is brave and all that stuff. She just happened to get pure genes? I feel like Roth saw there were some holes after the first book came out and tried to cover them up in the second and third, but didn't really think through it very well when that first book was published. I liked Divergent for the entertainment factor...I'm a total sucker for dystopian novels. However the writing was seriously SO awful, and the 2nd and 3rd books just get worse in my opinion. I read all 3 books relatively quickly but felt no real attatchment to the characters, even Tris. I like to feel an emotional attatchment to the characters of a book and Tris, Four and the gang just didn't do it for me. Give me Harry and Ron and Hermione, give me Katniss and Peeta, give me anyone other than Tris. So so pleased I wasn't the only one who struggled with this book. Its interesting that you mentioned Veronica's blogs as I totally agree that they are so much better written than this book. Have added my link in the link up box - lets just hope next months book fares better! Right? Her blog is killer! There is so much voice and fun in her writing and I don't know what happened with her book, but that didn't translate at all over to Divergent. Such a bummer. Can't wait to read your post! Wow I didn't really think about half these things as hard as you did! As for the whole everyone fits into a faction thing, you kind of have to read the rest of the series to understand why society is like that. Really most dystopian books don't make sense because society always moves backwards in them instead of forwards and does things that actually make life more difficult. I did like the book, but I kind of agree with the one comment I see here that I didn't really feel the same connection to the characters in Divergent that I do to characters in other books. That's the problem. I try to not think about those things are hard, I just can't enjoy the book because those things get in the way! I get that most dystopian books don't make sense but they at least have to make sense in their not making sense. Make sense? (WOW!) Like hunger Games at least makes sense why they have the hunger games, why there are different districts, etc. She at least has her world explained while I don't feel like Roth did that. Besides that, I honestly found Tris and Four's relationship to be a bit dry. Besides the few random make outs there did not seem to be any real passion or connection between the two! I'm now listening to book two while running and it's quickly losing my interest. I just feel somewhat committed now to see if through to the end! See that's so interesting that you enjoyed it on tape because it wasn't until after I stopped listening to it and started reading it that I enjoyed it more. I really struggled listening to it... but I also have listening problems. I'm much more of a visual learner. I love your idea about it being a natural evolution of humans after having learned only one thing, and I think if that is what Roth was going for then she should have explained that more. But then that doesn't really explain how your brain would test into a different category and how you would be looked down upon and disowned if your brain did do that. I guess it just seems pretty out of someone's control to receive so harsh a punishment as not seeing your family anymore. Those are really two separate issues, though. I had high hopes for the book(s) (since I ended up reading the whole series), but I agree with you that the author just had a weak foundation to begin with and it just crumpled as she tried to add to it. It's a shame, because it kiiiind of had potential. I'm seeing the movie this weekend, and I am so curious how they will make the other movies as the story falls apart. Not to mention the ending which definitely doesn't fit into Hollywood's happy perfect ending that everyone wants. To me the ending didn't bother me because it wasn't happy or wasn't what I wanted, it bothered me because it was totally out of the blue, random, and basically had nothing to do with the first 400 pages of the book. I've been trying to read this book since like November and still haven't finished. I agree that it's just not well written enough for me to be interested. I do want to see the movie tho and see if it's any better! Wow, since November! I think it's time to call it a day! I felt like the death of Tris' parents was a bit much too...I was honestly really bummed about Tris' mom dying right after Tris realizes who she is (which I agree with you on the whole "I must spell this out for you in case you don't get it" that Roth does in the story). It would have been a interesting story arc for her mom to survive and maybe delve into her past a bit and then help Tris with her current situation. Totally agree with you on both accounts. Twilight writing is absolutely horrible. I love your point about the potential in Tris' and her mom's relationship. I would have loved to see Roth develop that more and THEN if she wanted to kill off the mom it would have actually meant something and been a meaningful and sad death, not just some pointless and random death. I liked the book, but after reading your thoughts I totally get why you feel the way that you do! Now I feel bad like I dashed everything you know and love! I like the series, yes. I love Tris and Four, I think they're super cute. I also like some of the idea of the premise and all. But honestly- I can't argue on ANY of your points here. They explain a bit about the whole faction thing and everyone being sorted into them in the third book, but it's a pretty weak explanation. And the ending of the trilogy is THE ACTUAL WORST. It honestly almost made me not want to see the movie because I was so angry. So as to not reveal spoilers here, feel free to email me and I can tell you why I think it's so awful. However, I can't wait for The Night Circus next month. It's one of my all time favorite books ever. I'm listening to it on audio right now - but don't do that your first time because it would be SUPER confusing! I might then re-read it in an actual book if I have time... lol. But for serious, email me about this series so I can completely vent about the ending of the trilogy. Yes! I want an email explaining why you hated the end of the series. I will be interested to see how she ended the whole thing. And I agree, the premise of the story had potential, but then it got ruined. Also, I didn't mention in my post but i felt like it was just a rehashing of others' ideas. The sorting, the love story, the corrupt government, all borrowed from different books and thrown together. There was really nothing new or original brought to the table. THANK YOU, this book was terrible. So glad you wrote this, lol. I read it and, like you, will not be reading the next two. I had to force myself through it and kept calling it "a poor man's Hunger Games." Come back to us, JK Rowling. Yes, please! We need you JK Rowling! I also kept thinking about other books I have read during this. I, however, loved it. :) check out the link for more of my opinion. I can't wait to read it! I'm so glad that some of you who liked the book are speaking up in defense of it! I am very easily entertained and not analytical at all when it comes to what i am reading, so i loved the first two-I HATED the third (you know why) and also felt like it was so unnecessary-it was like the first two books were for nothing. I am hoping they change that it in the third movie. The movie was really good-not enough make out scenes for me though!! Theo James (who plays 4) is just so so attractive!! Great post, I love reading these! "Not enough make out scenes"- a girl after my own heart! Your point where the third book made the first books unnecessary is exactly how I felt about the first book. Why did I read so much about becoming dauntless if she wasn't going to be dauntless? Hundreds of pages about initiation FOR NOTHING! I read this book and couldn't quite verbalize why I didn't like it. You did it, beautifully, though. Everything you listed above bugged me to no end. I'm surprised I don't have permanently sprained eyes from rolling them at the poor writing and even worse story. I just could not like the characters or relate to them in any way; I find that I just did not care what happened to them. Oh, and I could have told you the 'big twist' about their city within the first few chapters. So predictable there. I found myself thinking 'what is the point of all this' so many times. And don't even get me started on the end of the book. Just no. I did go on to read the second book, in the hopes some of my questions would be answered. Sadly, that was not the case. I can't bring myself to read the third, because I already read the plot and spoilers. I read the plot and summaries for the second and third book, too. I wanted to know what happened, but like you, couldn't bring myself to suffer through the writing. Sounds like I don't miss out on much. Mostly it feels like to me she started writing not really knowing where the story was going to go and then, voila, look where she ended up! I definitely don't feel like she had a good idea the whole time of where it was going. Also for anyone who will continue to read or has read, there is a reason for the last book to bd told from two points if view. The book would end with no conclusion if it didn't. If you've read it you'll understand. I haven't yet read it but I've heard the ending and that must be the reason. The story must continue. ? I read the spoilers for the third book so I know how it ends. My opinion is if something in the story is going to require you to have more than one point of view than you should be doing that for the whole series. That's why I say that it feels like she was just kind of winging it... figuring it out as she went. It you want two POVs then fine, but do it the whole time, not just for one book. I'm so glad you mentioned that about the voice of the woman who reads this on tape! I listened to it in my car also and her voice really bugged me. It was like too raspy and sometimes I had to listen to it really loud to understand her. It was strange. I liked the book and got halfway through Insurgent before kind of losing interest. The movie does not do a good job of developing the relationships between characters which was disappointing but it was still entertaining. I thought I liked this book, but now I'm doubting my own judgments. ;) I read it more than a year ago, and some of the details are fuzzy. While it is nothing compared to Harry Potter or even The Hunger Games, it isn't the worst dystopian I've read (don't get me started on the Birthmarked trilogy!). I want to see the movie, but I don't like Shailene Woodley as an actress so I'm a little hesitant. I feel bad- like these comments have just turned into a bashing session. I think it's great that you liked it! I definitely don't think it was the worst dystopian I've read either- I guess my expectations were too high given all the hype around the books and movies. I'll warn you - the movie is drastically different than the book. But, in my opinion, not in a good way! If you think the genocide popped up out of no where in the book than it REALLY popped up out of nowhere in the movie! Oh, man. I'm excited to see the movie this weekend and let you know what I thought of. Yes, I can hear you on the trashy but still good factor- some stuff you just want to be entertained by and not have to think. I couldn't do it with this book, though. That article won't pull up on my computer so I'll have to read it from home, but I would love to see it. I do love the idea of our heroines not having to be beautiful- although it was sort of nullified by the movie when they cast a pretty actress to play Tris. I'm going to be the sore thumb...I really liked the series. Now I didn't like that it was in first person and I think if you didn't like the first book, then Tris's emotions in the two final books might be too much for you to handle. As I wrote on my blog though, I thought it was a nice change of pace that not everything is happily ever after. In HP barely any of the name characters died. Same with Twilight and Hunger Games. So for me, it was nice to see an author take a risk. I also listened to the audio book. I can see what you mean about it being a little dramatic. At the same time though it is a present tense novel, told through the eyes of a 16 year old, and so I thought she nailed the voice of the character. You're not being a sore thumb! I'm glad you liked the series. Very interesting point about not following the happily ever after pattern, and I agree I like it when author's take risks with their characters. At the same time, though, I feel like there is this mentality that there has to be death or someone close to the character has to die to make the book good or more poignant or something. In reality, not that many teenagers have immediate friends and family close to them who die so it seems weird that we feel like for the story to be "real" someone has to die. And if you are going to kill off main characters then I feel like the death should have a purpose or be meaningful in some way. Her parents' death just seemed so random and pointless. I liked Divergent but that's because I really like YA Dystopian fiction (no matter how done it is) and when I go into it not expecting much. I do think my favorite part is just Tris + Four falling in love but I also think he's better than her. To whoever said in one of the comments that Four reminded her of Edward Cullen -- definitely did NOT get that at all ... and I hate Edward Cullen. There are a lot of plot holes and even when you keep reading the books it's too much. I HATE YA Dystopian fiction because it always falls into the trap of having these characters be so one-dimensional and all good or all bad. YES to the plot holes YES to one dimensional characters. I can't comment much on the Edward Cullen. I read the first Twilight seven years ago and never read more than that one book. I did see the movies, but I fell asleep a lot in them so I don't feel like I can accurately pass judgment on Edward's character. I do like Four as a character, though, and felt like he had a lot of potential for the next two books, if not some weird character inconsistencies. I'm laughing because I had all the same reactions to the book that you did. I did like it, but I didn't love it and ended up reading the next two books. SPOILER ALERT: I hated them. What the heck. I felt like nothing ever got explained and the entire second book Tris was so freaking distraught over having killed Will and wouldn't shut up about it. I just wanted to be like CONFESS AND STOP ALREADY. Glad to know I wasn't the only one! More than anything this comment just confirmed my decision to not read the second and third book, so THANK YOU. This was so interesting to read! Okay, so I loved the Diveregent series (well, not the last one…) and felt I connected with the characters. The writing style I believe is geared to a YA audience, so I wasn't really expecting something amazing and could look beyond it for the story itself. A lot of your questions about divergence and the factions are answered in the last two books, but not really well. I'm like you, I loved Tris and Four and their relationship the best (romance! ), and thought the sweetness of that overpowered some of the bad for me. I do refuse to believe the ending of the third book, though, and will pretend that it never happened. All in all I really like the experience of reading the book rather than the moral of the story itself. LOL on refusing to believe the third book! I did read spoilers so now how it is supposed to end. I do think it's an odd decision, I'll say that much. I hear you on the writing style being geared to a YA audience, but I still think you can have better writing than that. John Green writes YA and he tries much, much harder with his writing than that and does a terrific job. Okay so I actually liked Divergent and Insurgent. I agree with you on many of your critiques, though. It's not amazing literature. But listen, if you think the dystopia idea wasn't well thought in the first book, then you've GOT to read the third one. It was one of the worst books I've ever read. The "shocker" in the third book isn't even the worst part- it's so clearly obvious Roth had NO idea where she was going with the storyline. It made me furious. I've heard the third book is terrible. I do know what the "shocker" is and I agree with you that Roth didn't have a clear idea where the book was heading when she started. Ah, authors these days! i read half the book and went and saw the movie before i was finished... yeah, wasn't thrilled. i mean, its entertaining. i didn't hate book or movie, but it definitely was no harry potter. (which i feel like i compare all YA book series to, including twilight which was terrible. i'd say this was a step up from that.) i would also take hunger games over the divergent series any day! Harry Potter is my standard of measurement, too! Actually I started the series again last night after reading and writing about Divergent all day. I just needed to go back to the good stuff! I love Hunger Games, too, except for the third book which was incredibly weak in my opinion. I have read the first two books and I find them to be too similar. I haven't started book three because I feel like I'll just be reading the same book for a third time. As you said, the story is predictable and the writing not great. Oh Bon Bon you made my heart hurt! 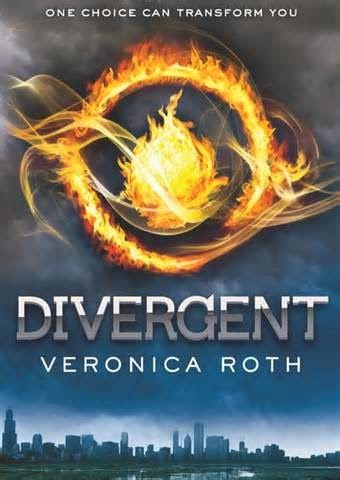 I LOVED Divergent and its sequels! But then again, I knew it wasn't going to be Hemingway or anything. I loved it because I could connect with Tris and loved the love story, which helped me overlook a poor plot and choppy sentences. I see a lot of your negative points about the book....but for some reason I still liked it! I didn't even question the things you questioned. I just mindlessly read along. I did read the second book and am halfway through the third book and I can say a lot of the questions you had above were answered. The two books really delve more into the "why" of the things that happened and give a lot more back story on all of the characters. But, if you hated the first book, I can imagine reading the second and third wouldn't be on your list of things to do, questions or not! It actually seems like all of the books should be one big, long one, but they split them up. The second book literally picks up at the next sentence after the first one ended. I agree with you on so many points! This series has been all the rage, but I just never really got it. I read all 3 books, mostly just because I wanted to know how it ended, but I lost interest very quickly with the story line. I do think that some of the things you thought didn't make sense make a little more sense in the later books as the story develops. Like why being Divergent isn't super common, for instance. But overall I thought Roth should have focused more on plot lines she totally threw away, and ditched some that she made a huge deal. And I kind of ended up hating Tris and Four both by the third book as well. I definitely agree with you on the choppy sentence structure as well! That drives me crazy to read. I was on the hold list for this at my library FOREVER, so when I got the alert that Divergent was available, I immediately went and got it. I completely agree you. For all the hype it let me down. I love to read and for certain types of books can turn off the analytical, but I couldn't.t for this. I enjoyed the beginning and even the initiation, but the ending was the worst. I read through it so fast, because I didn't care what happens. Absolutely hate when that happens when I read a book. It reminded me of the feeling I had after reading Mockingjay... completely disappointed. When I first began this book, I was really disappointed because I felt like I was reading a "hunger games" copy cat. But I trudged on because all the girls in my office were reading it and I wanted to be "in" with the cool kids. I actually ended up really enjoying the first and second book but the third book...someone should have gagged me. Not only was it a pain because I was reading it on my kindle, so I had to keep going back and viewing who was writing the chapter...but it was horribly sad. I hadn't realized that it was written from such an apocalyptic point of view. Never once through the first 2 books did I even think that it was Chicago and that it was the USA after a world war. I am a firm believer in humanity and the freedom that the US grants us as individuals in relevance to other countries. After seeing the movie this last weekend I was let down even more by the series. I didn't feel like 'Hollywood' did a good job at portraying the book really at all. There were so many things that were changed or altered and for the worse. The supporting actors all looked WAY to similar and was hard to tell them apart. They never went into the building of the characters....which make the whole series. You have to know the characters in order to understand how tragic everything is. In order to sympathize, feel empathy, joy, and relief....you HAVE to know the characters. The books did a good job at this, but the movie, not so much. I agree with what you said about the book. I did enjoy it but I'm not as much of a "book snob" as you say. I thought book 2 and 3 explained the faction system a little better and why they were created, so there's that. But I'm SO curious what you thought of the movie??? I am not going to read all 50,000 comments to see if anyone brought this up, but the next two pretty much resolve all your issues with the first. Maybe it'd be worth reading them to find some resolution...?